The saying ‘Your resume is the first step of your journey towards your dream job’ is definitely not hyperbole. A structured resume always helps recruiters to quickly judge whether you are the perfect fit for the role or not. But to create a resume that speaks about your skills and experience is always an uphill task. It’s a struggle not only for those just starting their career but also for professionals. 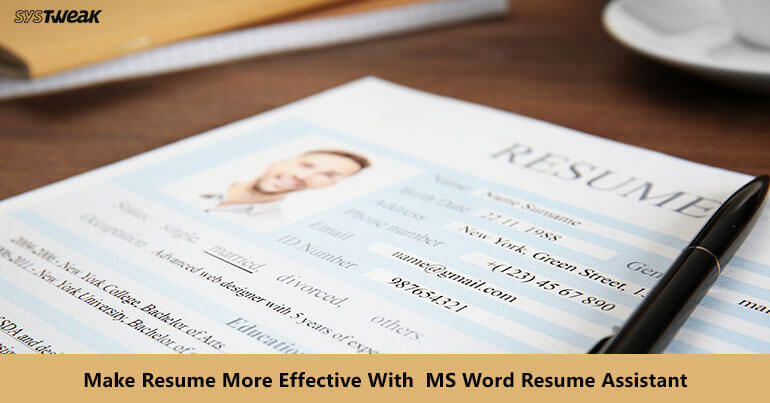 Thankfully this tedious task is now getting to be an ease with the introduction of Resume Assistant feature (powered by LinkedIn) in Microsoft Word. LinkedIn has collaborated with Microsoft to launch an all-new integration for Microsoft Word, Resume Assistant, which will help Office 365 subscribers to prepare a convincing resume. Resume Assistant feature uses LinkedIn data at back end and integrates it into Word. When a user selects his role for a specific profile and industry, Resume Assistant, which uses AI technique, looks for millions of same profiles in LinkedIn database. It then fetches multiple results which help user get a good idea on how other professionals in the same role define their work. Also, in case a user faces any issues in preparing a resume then LinkedIn ProFinder will assist in further simplifying the process. It also shows relevant job listings along with active job openings. A user can check the requirements of a job and in turn customize the resume for that role. Another option which a user can find inside this feature is Open Candidate. Turning On this option will send a signal to recruiters over LinkedIn that he is ready to take on new challenges and opportunities. In this way, it doubles their chances of selection. When Will This Feature Be Available? The feature has already gone live on 8th November for Office 365 subscribers who are a part of Office Insider Program with English as the only language. As per official Microsoft blog, it will first be available in Australia, Brazil, Canada, China, France, Germany, India, Ireland, Japan, Singapore, South Africa, Spain, New Zealand, United, Kingdom, and United States of America. For other countries and users, it will be rolled out in coming months.